Today is the birthday (1809) of Nikolai Vasilievich Gogol (Никола́й Васи́льевич Го́голь), [O.S. 19 March], a Russian writer of Ukrainian origin. Gogol was born in the Ukrainian Cossack village of Sorochyntsi, in Poltava Governorate of the Russian Empire, present-day Ukraine. His mother descended from Leonty Kosyarovsky, an officer of the Lubny Regiment in 1710. 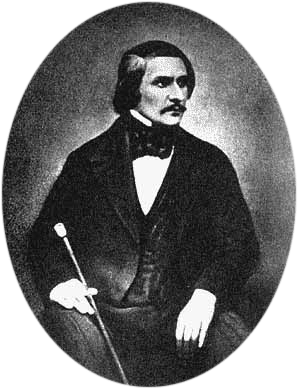 His father Vasily Gogol-Yanovsky, a descendant of Ukrainian Cossacks (see Lyzohub family) and who died when Gogol was 15 years old, belonged to the ‘petty gentry’, wrote poetry in Ukrainian and Russian, and was an amateur Ukrainian-language playwright. 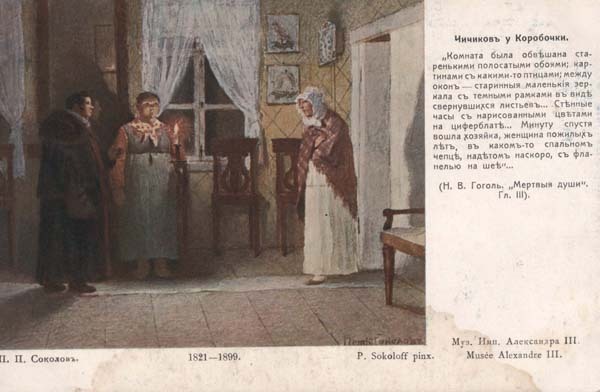 As was typical of the avant-garde Ukrainian gentry of the early 19th century, the family spoke Ukrainian as well as Russian. As a child, Gogol helped stage Ukrainian-language plays in his uncle’s home theater. In 1820, Gogol went to a school of higher art in Nezhin (now Nizhyn Gogol State University) and remained there until 1828. It was there that he began writing. He was not popular among his schoolmates, who called him their “mysterious dwarf”, but with two or three of them he formed lasting friendships. He developed a dark and secretive disposition, marked by a painful self-consciousness yet with strong ambitions. He developed a talent for mimicry, which later made him a matchless reader of his own works and induced him to toy with the idea of becoming an actor. In 1828, on leaving the university, Gogol went to Saint Petersburg, full of vague ambitious hopes. He had hoped for literary fame, and brought with him his Romantic poem of German idyllic life – Hans Küchelgarten. He had it published, at his own expense, under the name of “V. Alov.” The magazines he sent it to almost universally derided it. He bought all the copies and destroyed them, swearing never to write poetry again. 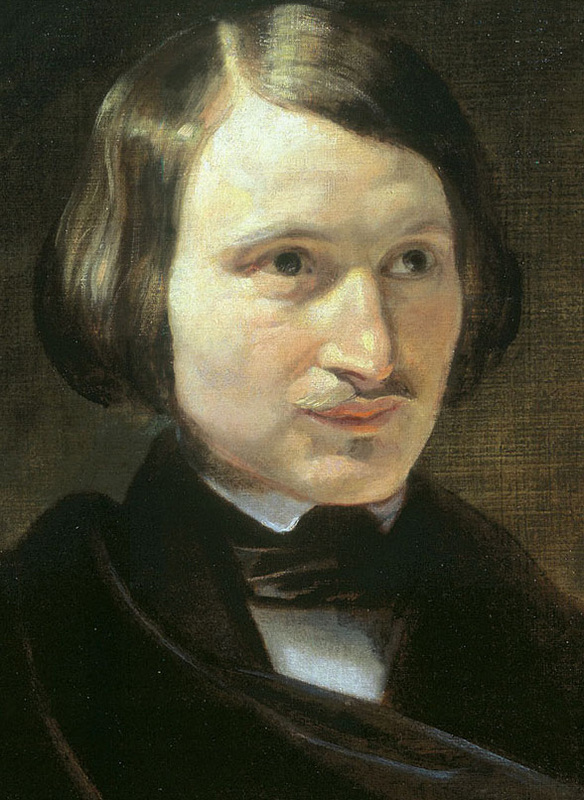 Gogol met the literary elite, had a story published in Anton Delvig’s Northern Flowers, was taken up by Vasily Zhukovsky and Pyotr Pletnyov, and (in 1831) was introduced to Pushkin. 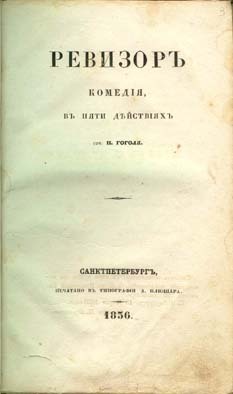 In 1831 Gogol brought out the first volume of his Ukrainian stories (Evenings on a Farm Near Dikanka), which met with immediate success. He followed it in 1832 with a second volume, and in 1835 by two volumes of stories entitled Mirgorod, as well as by two volumes of miscellaneous prose entitled Arabesques. At this time Russian editors and critics such as Nikolai Polevoy and Nikolai Nadezhdin saw in Gogol the emergence of a Ukrainian, rather than Russian, writer, using his works to illustrate supposed differences between Russian and Ukrainian national characters. 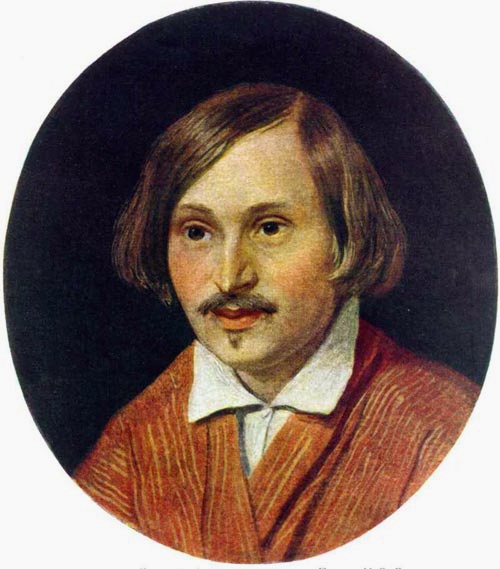 The themes and style of these early prose works by Gogol, as well as his later drama, were similar to the work of Ukrainian writers and dramatists who were his contemporaries and friends, including Hryhory Kvitka-Osnovyanenko and Vasily Narezhny. However, Gogol’s satire was much more sophisticated and unconventional. At this time, Gogol developed a passion for Ukrainian history and tried to obtain an appointment at the history department at Kiev University. Despite the support of Pushkin and Sergey Uvarov, the Russian minister of education, his appointment was blocked by a Kyivan bureaucrat on the grounds that Gogol was unqualified.] His fictional story Taras Bulba, based on the history of Ukrainian cossacks, was the result of this phase in his interests. During this time he also developed a close and lifelong friendship with another Ukrainian, the historian and naturalist Mykhaylo Maksymovych. In 1834 Gogol was made Professor of Medieval History at the University of St. Petersburg, a job for which he had no qualifications. He turned in a performance ludicrous enough to warrant satiric treatment in one of his own stories. After an introductory lecture made up of brilliant generalizations which the ‘historian’ had prudently prepared and memorized, he gave up all pretense at erudition and teaching, missed two lectures out of three, and when he did appear, muttered unintelligibly through his teeth. At the final oral examinations, he sat in utter silence with a black handkerchief wrapped around his head, simulating a toothache, while another professor examined the students. This academic venture was such a failure that he resigned his chair in 1835. 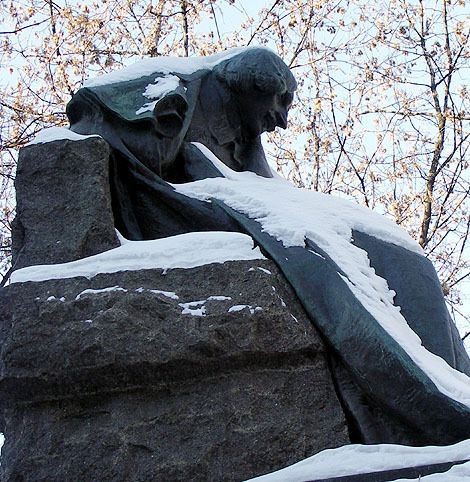 Pushkin’s death produced a strong impression on Gogol. His principal work during years following Pushkin’s death was the satirical epic Dead Souls. Concurrently, he worked at other tasks – recast Taras Bulba and The Portrait, completed his second comedy, Marriage (Zhenitba), wrote the fragment Rome and his most famous short story, “The Overcoat”. In 1841 the first part of Dead Souls was ready, and Gogol took it to Russia to supervise its printing. It appeared in Moscow in 1842, under the title, imposed by the censorship, of The Adventures of Chichikov. The book instantly established his reputation as one of the greatest prose writers in Russian. After the triumph of Dead Souls, Gogol’s contemporaries came to regard him as a great satirist who lampooned the unseemly sides of Imperial Russia. They were not aware that Dead Souls was but the first part of a planned modern-day counterpart to Dante’s Divine Comedy. The first part represented the Inferno; the second part would depict the gradual purification and transformation of the rogue Chichikov under the influence of virtuous publicans and governors – Purgatory. In April 1848 Gogol returned to Russia from a pilgrimage to Jerusalem and passed his last years in wandering the country. While visiting cities he stayed with friends such as Mikhail Pogodin and Sergey Aksakov. During this period, he also spent some time with his old Ukrainian friends, Maksymovych and Osyp Bodiansky. He intensified his relationship with a starets (spiritual elder), Matvey Konstantinovsky, whom he had known for several years. Konstantinovsky seems to have strengthened in Gogol the fear of perdition by insisting on the sinfulness of all his imaginative work. Extensive and severe ascetic practices undermined his health and he fell into deep depression. On the night of 24th February 1852, he famously burned some of his manuscripts, which contained most of the second part of Dead Souls. He later claimed this was a mistake, a practical joke played on him by the Devil. Soon thereafter, he took to bed, refused all food, and died in great pain nine days later (4th March). Gogol was mourned in the Saint Tatiana church at the Moscow University before his burial and then buried at the Danilov Monastery. His grave was marked by a large stone (Golgotha), topped by a Russian Orthodox cross. In 1931, Moscow authorities decided to demolish the monastery and had Gogol’s remains transferred to the Novodevichy Cemetery. 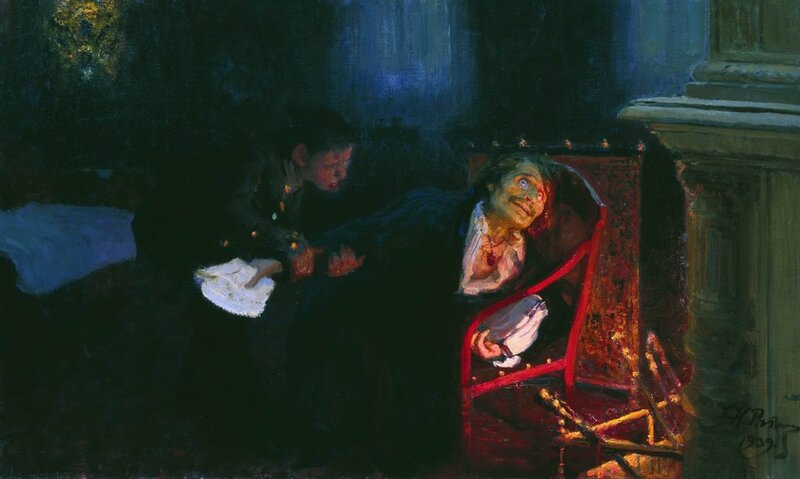 His body was discovered lying face down, which gave rise to the story that Gogol had been buried alive. The authorities moved the Golgotha stone to the new gravesite, but removed the cross; in 1952 the Soviets replaced the stone with a bust of Gogol. 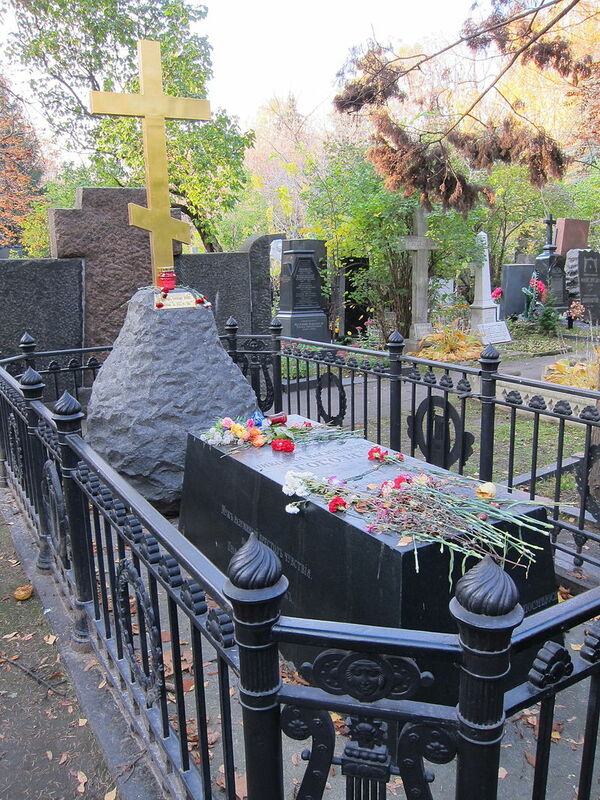 The stone was later reused for the tomb of Gogol’s admirer Mikhail Bulgakov. In 2009, in connection with the bicentennial of Gogol’s birth, the bust was moved to the museum at Novodevichy Cemetery, and the original Golgotha stone was returned, along with a copy of the original Orthodox cross. 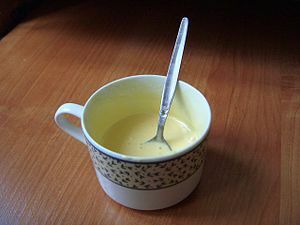 When traveling, Gogol would sometimes buy fresh milk at the coach stops, skim off the cream, and churn his own butter. One of his favorite dishes was boiled goat’s milk mixed with rum, which he jokingly called gogol-mogol. Kogel mogel, gogl-mogl, gogel-mogel, gogol-mogol (Гоголь-моголь), gogli-mogli, or gogle-mogle is an egg-based homemade dessert popular in Central and Eastern Europe, as well as in Caucasus. The dish consists of raw egg yolks and sugar, beaten and ground until they form a creamy texture, with no discernible grains of sugar. In modern kitchens, it is often mixed in a blender until it changes color and becomes thick. A classic single Gogl-Mogl portion is made from two egg yolks and three teaspoons of sugar beaten into a cream-like dish. Variations can be made by adding chocolate, vodka, rum, honey, vanilla, lemon juice, orange juice, raisins, whipped cream, or a number of other ingredients based on taste preferences. And bake us a four-cornered fish pie,” he said, sucking the air through his teeth and inhaling deeply. “In one corner I want you to put the sturgeon cheeks and the gristle cooked soft, in another throw in some buckwheat, and then some mushrooms and onions, and some sweet milt, and the brains, and whatever else, you know the sort of thing. And make sure that on the one side it’s, you know, a nice golden brown, but not so much on the other side. And the pastry, make sure it’s baked through, till it just crumbles away, so that the juices soak right through, do you see, so that you don’t even feel it in your mouth, so it just melts like snow. 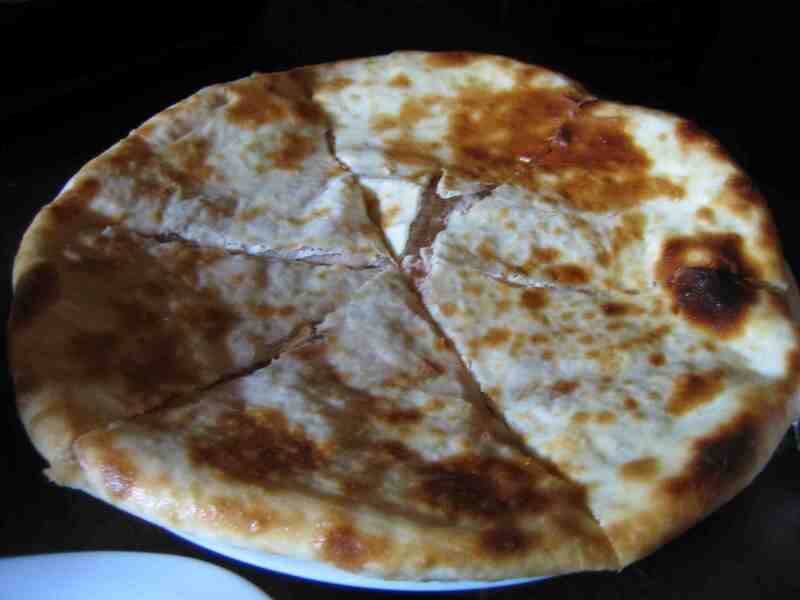 Kulebiaka is a pie with four distinct fillings, distributed in such a way that a slice contains all four. Making it is a rigmarole, and I have never done it. Instead I give you this website which has complete instructions with a ton of photos showing the steps. 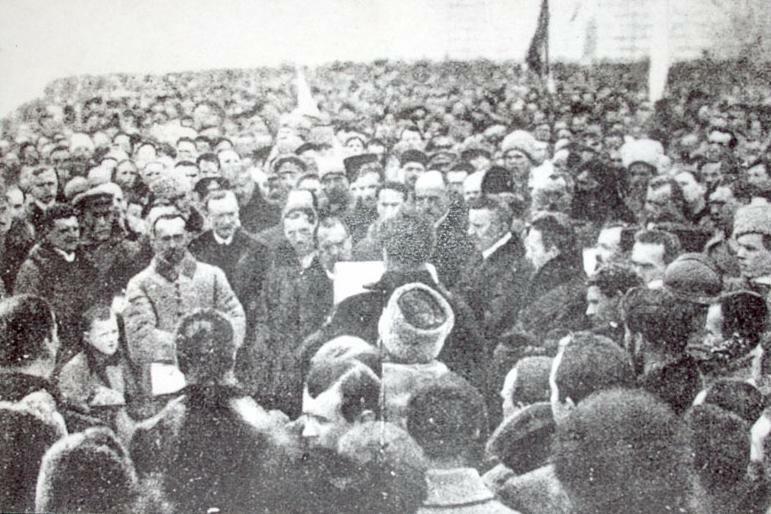 The Unification Act (Ukrainian: Акт Злуки, Act Zluky) was an agreement signed on January 22, 1919 by the Ukrainian People’s Republic and the West Ukrainian People’s Republic in St. Sophia Square in Kiev. Since 1999 the Day of Unity of Ukraine, celebrated every year on 22 January to mark the signing of the treaty, is a state holiday. 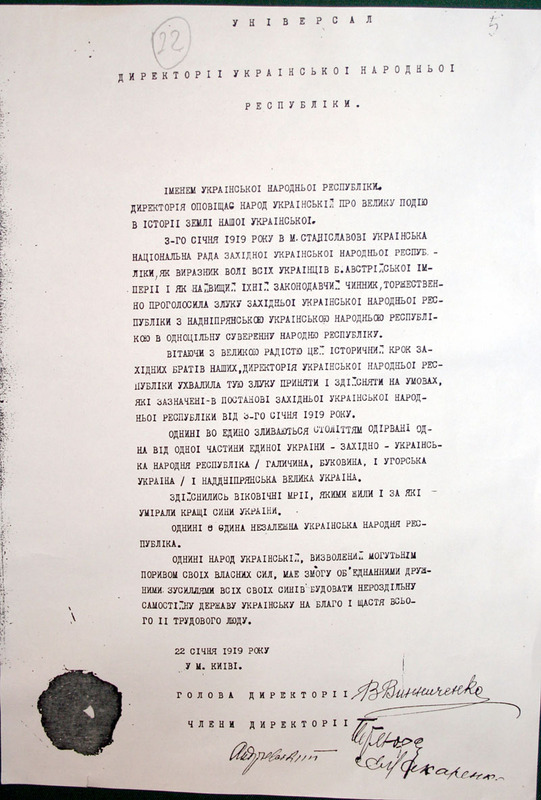 The agreement was aimed at creating a unified Ukrainian state, a movement long awaited by the intelligentsia on both sides. However, the Act Zluky was regarded as purely symbolic in that both governments still retained their own separate armies, administrations and government structure. The territory of Ukraine, divided over the centuries, including Galicia, Bukovyna, Carpathian Ruthenia, and Dnieper Ukraine will now become a great united Ukraine. Dreams, for which the best sons of Ukraine fought and died for, have come true. However the territory of Ukraine was unable to retain independence and in December 1920 the Ukrainian SSR of the Soviet Union was established consisting mostly of the territory of the Ukrainian People’s Republic. The territories of the West Ukrainian People’s Republic became part of Poland. In 1939 the territories of both became part of the Ukrainian SSR, and remained so until the fall of the Soviet Union. To mark the 71st anniversary of the signing of the Act Zluky in 1990, over 300,000 Ukrainians created a human chain (approx. 482 km (300 mi)) from the capital Kiev to the western Ukrainian city of Lviv on January 21, 1990. The chain, the largest public demonstration in Ukraine since the beginning of Glasnost, was funded by the People’s Movement of Ukraine (Rukh). Also, for the first time since the period of the Ukrainian People’s Republic, the blue and yellow national flag was raised. On January 21, 1999, the President of Ukraine Leonid Kuchma decreed the “Day of Reunion of Ukraine” (Ukrainian: День Соборностi України, Den’ Sobornosti Ukrayiny), a government holiday, celebrated every year on January 22 to mark the political and historical significance of the 1919 agreement. In December 2011, President Viktor Yanukovych caused public controversy when he merged the “Day of Freedom” into this day, naming it officially “Day of Unity and Liberty of Ukraine” (Ukrainian:День Соборності та Свободи України, Den’ Sobornosti ta Svobody Ukrayiny). The public outcry underlines an important issue: unity and independence are not to be confused. A nation may be unified but under the control of another power; or it might be independent but not united. The latter was the case with Ukraine in 1919. In the aftermath of World War I its constituent regions were newly independent but separate political entities. Act Zluky is celebrated on this day because it represented a step towards a longstanding desire for Ukrainian unity – even though it was only a token, and Ukraine was soon divided up between neighboring powers (and then subsequently united but under Soviet control). The day continues to be an important celebration of the nationalist aspirations of nineteenth and twentieth century Ukrainian intellectuals which has now become a reality. I doubt I have spent a single day in Ukraine without eating varenyky of some sort – quite often for breakfast as well as lunch. Varenyky are square- or crescent-shaped dumplings of unleavened dough, stuffed with mashed potato, sauerkraut, cheese, cabbage, meat, or a combination of these, or with a fruit filling. 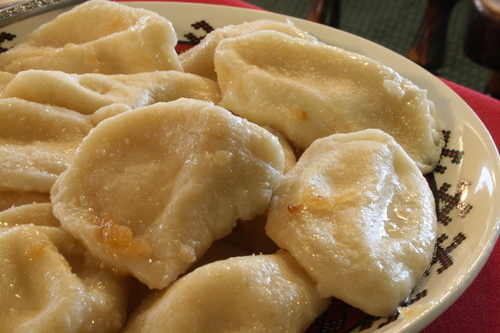 Under various names, such as pierogi and pelmeni, these dumplings are ubiquitous in eastern Europe, but each with their own little twist. Commonly they are boiled to cook the dough, then sautéed with melted butter and served tossed with sour cream, or topped with fried salo bits (cured pork fat) and onions. Dill is also a common garnish. Sweet, fruit-filled varenyky are served with sour cream and sugar. 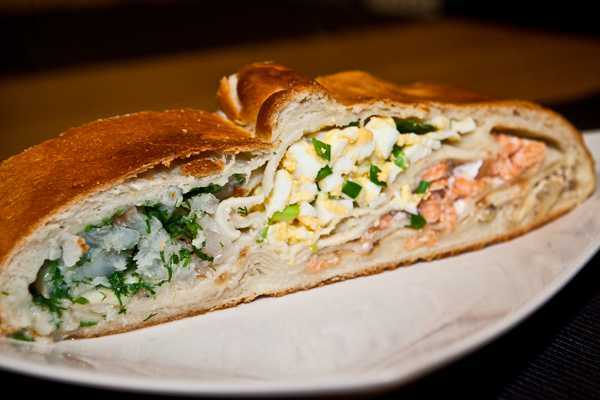 The dough varies widely even within Ukraine, from plain flour and water to rich combinations of flour, sour cream and egg. I prefer a richer dough to contrast with plainer fillings such as mashed potato. Here is one of version of varenyky that works for me. If you can get kefir (fermented milk) it is good in place of the sour cream. Potato and onion is an extremely common filling, but for variety in this recipe you can exchange some of the potato for sauerkraut or farmer’s cheese. Make the filling first. Boil and mash the potatoes. Sauté the onion very gently until it is a rich golden color. Reserve a small amount of the onion for a garnish and combine the rest with the potato and mix thoroughly. Add salt to taste. To make the dough, combine the flour, sour cream, and butter and mix well. Beat the egg in a measuring cup and add enough water to the beaten egg to make ¾ cup. Add the egg to the flour mixture and combine to make a smooth dough. You may have to adjust the amount of flour or liquid to make sure the dough is silky but not sticky. Do not knead the dough too much because excess gluten will make the resultant product tough. Let rest for about 20 minutes. Roll the dough out to about ?” thick and cut out circles about 3” in diameter (I use a drinking glass for this). As needed re-roll the remainder and continue cutting until all the dough is used. Place a heaping teaspoon of filling in the center of each circle and fold it over to form a half moon. Crimp the edges well. Working in batches, boil the varenyky for about 5 minutes per batch. They will readily float when they are cooked. Remove them with a slotted spoon and drain on wire racks. Heat butter in a heavy skillet. Again, working in batches add the cooked varenyky and sauté until they are golden on both sides. Toss with sour cream and onions and serve warm garnished with a little chopped dill if you like. Today is the feast day of Saint Barbara, (santa Barbara), venerated in both eastern and western churches as a saint and martyr. Accounts place her in the 3rd century in Nicomedia, in present day Turkey or in Heliopolis in Egypt. There is no reference to her in authentic early Christian writings, nor in the oldest version of Saint Jerome’s martyrology. Her name can be traced only to the 7th century, but veneration of her was common, especially in the East, from the 9th century. Because of doubts about the historicity of her legend, she was removed from the liturgical calendar of the Roman Rite in 1969 in Pope Paul VI’s motu proprio Mysterii Paschalis, which eliminated a host of saints, many of whom, like Barbara, were widely venerated. 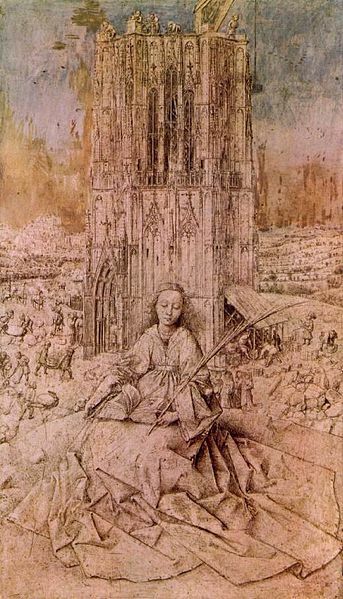 Saint Barbara is often portrayed with miniature chains and a tower. As one of the Fourteen Holy Helpers, Barbara continues to be a popular saint in modern times, despite the pope’s injunction. 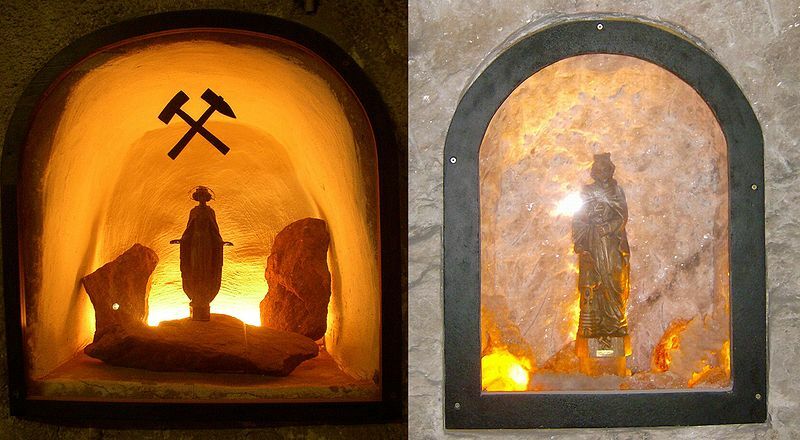 She is best known as the patron saint of armorers, artillerymen/women, military engineers, miners and others who work with explosives, because of her old legend’s association with lightning. She is also patron of mathematicians. According to the hagiographies Barbara­­­­­­­­­­­­ was the daughter of a rich pagan named Dioscorus who kept her locked up in a tower in order to preserve her from the outside world. Having secretly become a Christian, she rejected an offer of marriage that she received through him. Before going on a journey, he commanded that a private bath-house be erected for her use near her dwelling, and during his absence, Barbara had three windows put in it, as a symbol of the Holy Trinity, instead of the two originally intended. 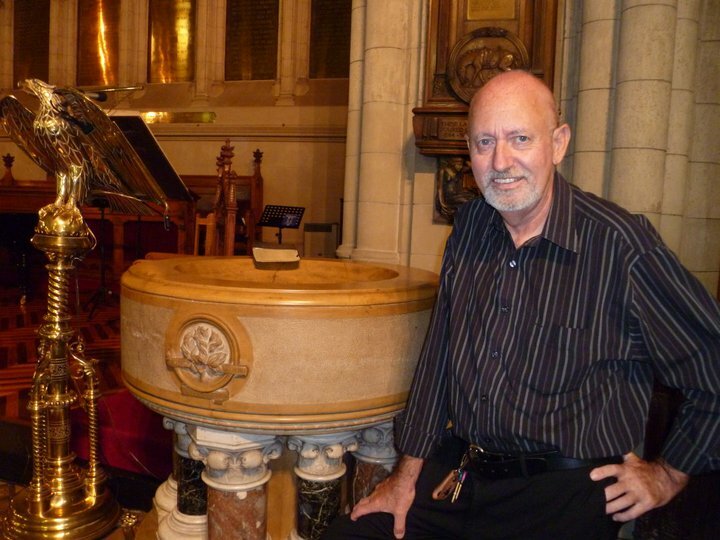 When her father returned, she acknowledged herself to be a Christian. 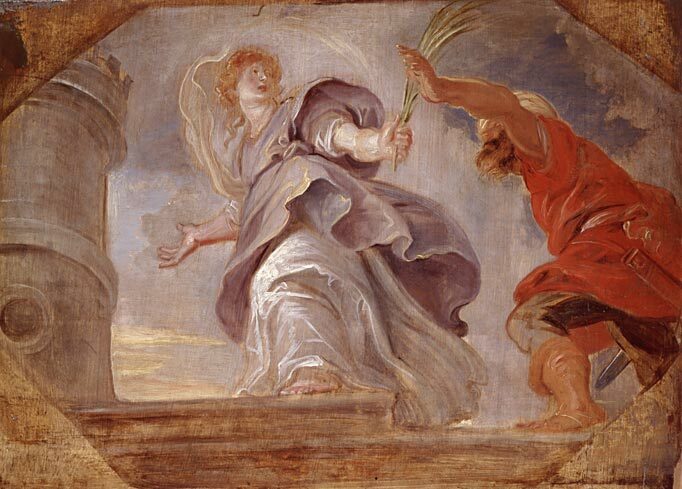 Upon hearing this he drew his sword to kill her, but her prayers created an opening in the tower wall and she was miraculously transported to a mountain gorge, where two shepherds watched their flocks. Dioscorus, in pursuit of his daughter, was rebuffed by the first shepherd, but the second betrayed her and was turned to stone and his flock changed to locusts. Dragged before the prefect of the province, Martinianus, who had her cruelly tortured, Barbara held true to her faith. During the night, the dark prison was bathed in light and new miracles occurred. Every morning her wounds were healed. Torches that were to be used to burn her went out as soon as they came near her. Finally she was condemned to death by beheading. Her father himself carried out the death-sentence. However, as punishment for this, he was struck by lightning on the way home and his body was consumed by flame. Barbara was buried by a Christian, Valentinus, and her tomb became the site of miracles. 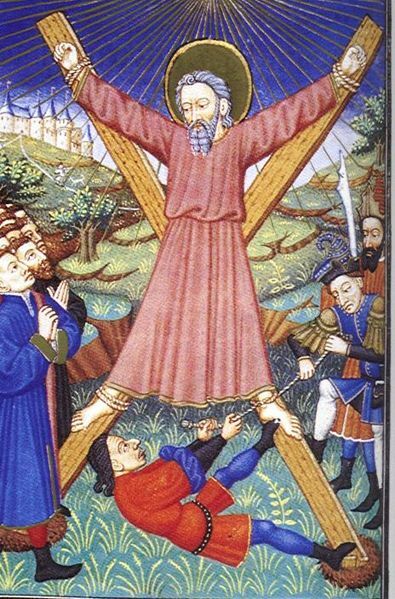 According to Legenda Aurea her martyrdom was December 4 “in the reign of emperor Maximianus and Prefect Marcien” (r. 286–305); the year was given as 267 in the French version edited by Father Harry F. Williams of the Anglican Community of the Resurrection (1975). Various documents, including two surviving mystery plays, differ on the location of her martyrdom, which is variously given as Tuscany, Rome, Antioch, Baalbek, and Nicomedia. Saint Barbara is one of the Fourteen Holy Helpers. Her association with the lightning that killed her father has caused her to be invoked against lightning and fire, and, by association, with explosions, and hence, artillery and mining. Her feast on December 4 was included in the Tridentine Calendar, having been introduced in Rome in the 12th century. In 1729 that date was assigned to the celebration of Saint Peter Chrysologus, reducing that of Saint Barbara to a commemoration in his mass. In 1969, because the accounts of her life and martyrdom were judged to be entirely fabulous, lacking clarity even about the place of her martyrdom, it was removed from that mass. But she is still mentioned in the Roman Martyrology, which, in addition, lists another ten martyr saints named Barbara. In the 12th century, the relics of Saint Barbara were brought from Constantinople to St. Michael’s Golden-Domed Monastery in Kiev, where they were kept until the 1930s, when they were transferred to St. Vladimir’s Cathedral in the same city. 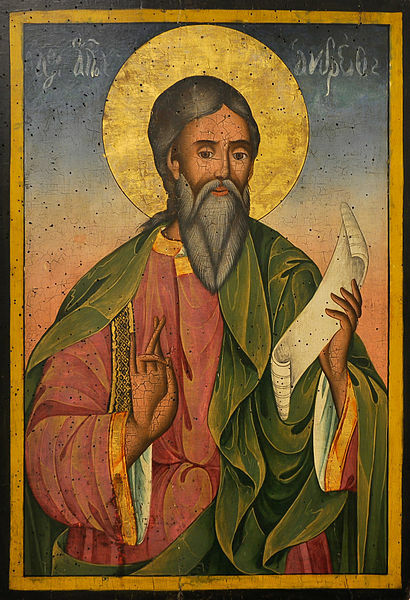 A small part of St. Barbara’s relics were brought to the United States by Patriarch Filaret of The Ukrainian Orthodox Church Kyivan Patriarchate in November 2012, they are permanently on display for veneration at St. Andrew Ukrainian Orthodox Cathedral in Bloomingdale, Illinois. 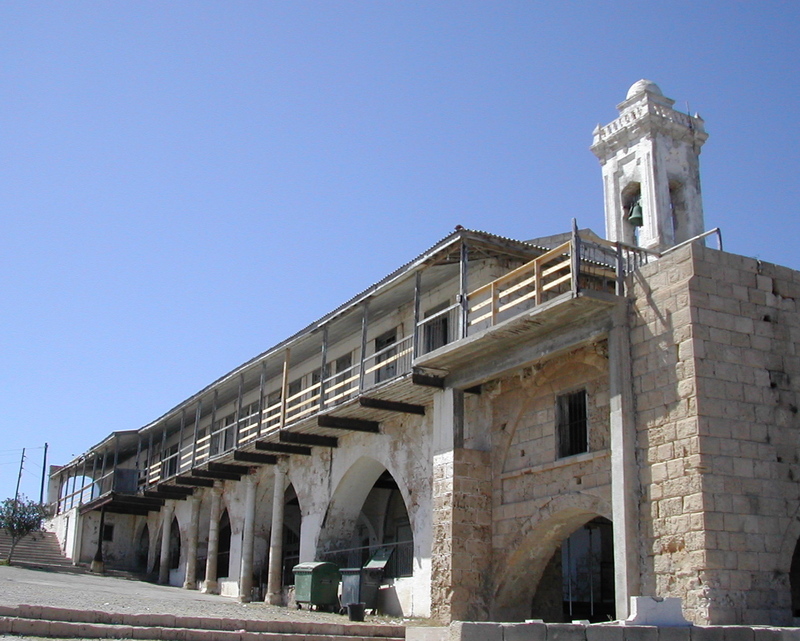 The Spanish santa bárbara, the corresponding Italian santa barbara, and the French sainte-barbe can be used in those languages to signify the powder magazine of a ship or fortress. It was customary to have a statue of Saint Barbara at the magazine to protect the ship or fortress from suddenly exploding. Saint Barbara’s Day, is celebrated in the armed forces by the British (Royal Artillery, RAF Armourers, and Royal Engineers, Australians (Royal Regiment of Australian Artillery, RAAF Armourers), Canadians (Explosive Ordnance Disposal Technicians, Canadian Air Force Armourers, Royal Canadian Artillery, Canadian Military Field Engineers, Royal Canadian Navy Weapons Engineering Technicians), and New Zealanders (RNZAF Armourers, RNZA, RNZN Gunners Branch), as well as by Irish Defence Forces Artillery Regiments, Norwegian Armed Forces Artillery Battalion, the United States Army and Marine Corps Field and Air Defense Artillery, Marine Corps Explosive Ordnance Disposal Technicians in many countries, and other artillery units. The units and sub-units celebrate the day with church parades, sports days, guest nights, cocktail parties, dinners and other activities. 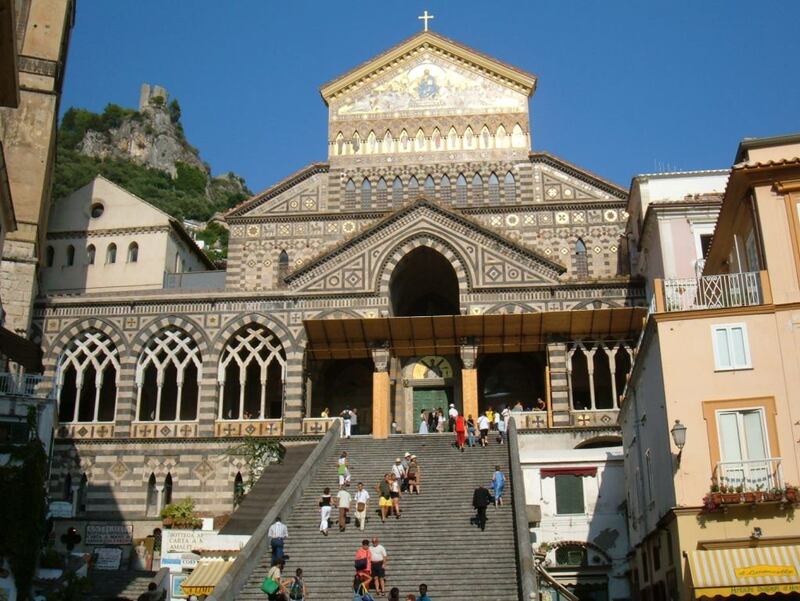 She is also the patron of the Italian Navy. Several mining institutions also celebrate the day, such as some branches of the Australian Institute of Mining and Metallurgy. Although they do not celebrate her saint’s day, she is the patron saint of US Navy and Marine Corps Aviation Ordnance. In Greece, the day is celebrated by the Artillery Corps of the Greek Army and the Cypriot National Guard. 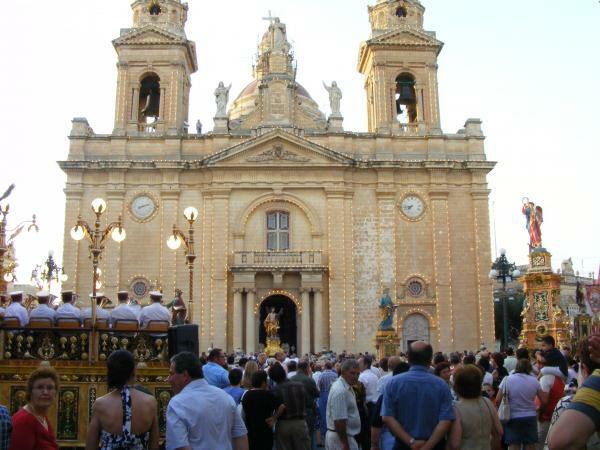 Artillery camps throughout the two countries host celebrations in honor of the saint, where the traditional sweet of loukoumades is offered to soldiers and visitors, allegedly because it resembles cannonballs. 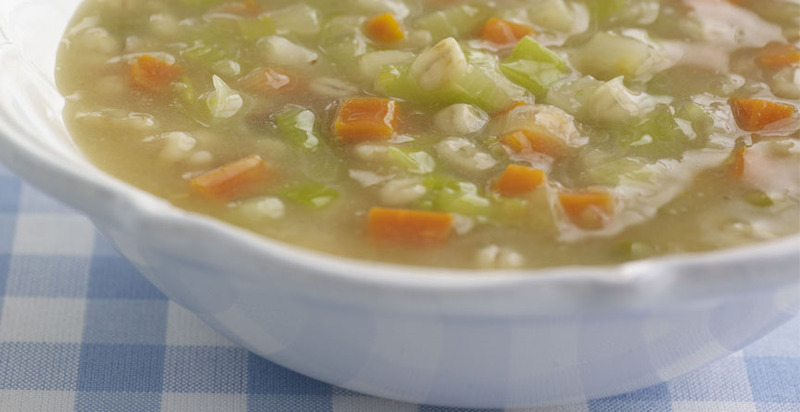 Saint Barbara is also the patron saint of the northern Greek city of Drama, where a sweet called varvara, which resembles a more liquid form of koliva (a sweet wheat porridge with fruit), is prepared on her feast day. The Spanish Artillerymen also venerate her as patron saint of their branch, and parades, masses and dinners are held in her honor and on behalf of those serving in the branch. The city of Santa Barbara, California, located approximately 100 miles northwest of Los Angeles, is named for the Mission Santa Barbara. The Franciscan mission was dedicated to her in 1602 after Sebastián Vizcaíno survived a violent storm just offshore on the eve of her feast day. Other Spanish and Portuguese settlements named Santa Barbara were established in Brazil, Chile, Colombia, Honduras, Mexico, Venezuela, and the Philippines. Many churches in Russia are dedicated in her name, including one in Moscow, next to Saint Basil’s Cathedral, and in Yaroslavl. In the Afro-Cuban and Afro-Brazilian religions of Santería, Candomblé, and Umbanda she is syncretized with Changó. 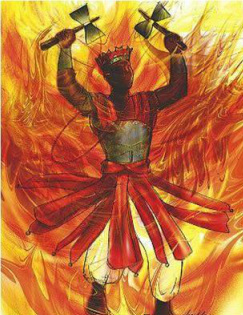 Changó (Shangó) is the deity of fire, lightning, thunder, and war, but he is also the patron of music, drumming, and dancing. He represents male beauty and virility, passion and power. His colors are red and white, and his eleke (sacred necklace) is made of alternating red and white beads. He is syncretized with Santa Barbara because she is portrayed in Catholic lore as a fiercely independent and brave young woman, dressed sometimes in a red and white costume, holding a sword and wearing a crown like Changó. The feast day for Changó/ Santa Bárbara is December 4, one of the most important festival days in Cuba. It may seem surprising that such a powerful masculine Orichá is syncretized with a female saint, but there are underlying links between their stories. For example, Santa Barbara’s father was struck down by a lightning bolt, which is Changó’s favorite weapon. And according to a patakí (sacred story) about Changó, one time he had to dress in women’s clothes (lent to him by Oyá) in order to escape undetected from his enemies. Santa Bárbara’s association with Changó shows that females and males alike can wield Changó’s power. Both male and female initiates can be crowned with Changó, making him their father in the religion. In Georgia, Saint Barbara’s Day is celebrated as Barbaroba on December 17 (which is December 4 in the old style calendar). 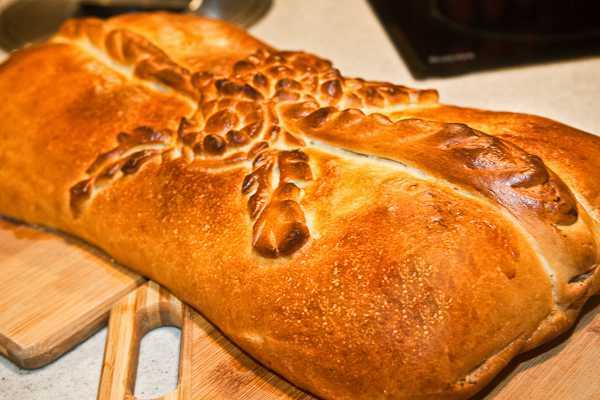 The traditional festive food is lobiani, bread baked with a bean stuffing. In Macedonia Saint Barbara’s day is celebrated as Варвара (Varvara) on 17th December. Some Macedonians celebrate with their closest family and friends at home, while others refrain, believing that people who step in their house on Saint Barbara’s day will give them either good or bad luck for the rest of the year. In the mining town Kalgoorlie, Australia, as patron saint of miners she is venerated in the annual St. Barbara’s Day parade. 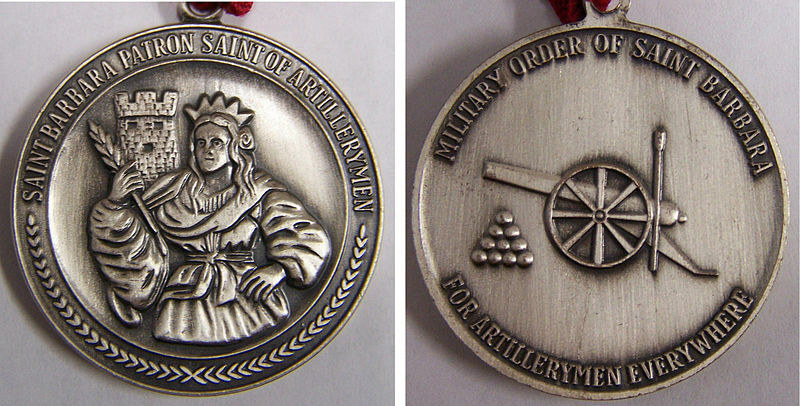 The United States Army Field Artillery Association and the United States Army Air Defense Artillery Association maintain the Order of Saint Barbara as an honorary military society of the United States Army Field Artillery and the United States Army Air Defense Artillery. Members of both United States Marine Corps and United States Army, along with their military and civilian supporters, are eligible for membership. There are two levels of membership in the order, The Ancient Order and the Honorable Order. The most distinguished level is the Ancient Order. Saint Barbara’s day or Eid il-Burbara is celebrated in Syria, Lebanon, Jordan and Palestine among Arab Christians annually on December 4, in a feast day similar to that of North American Halloween. 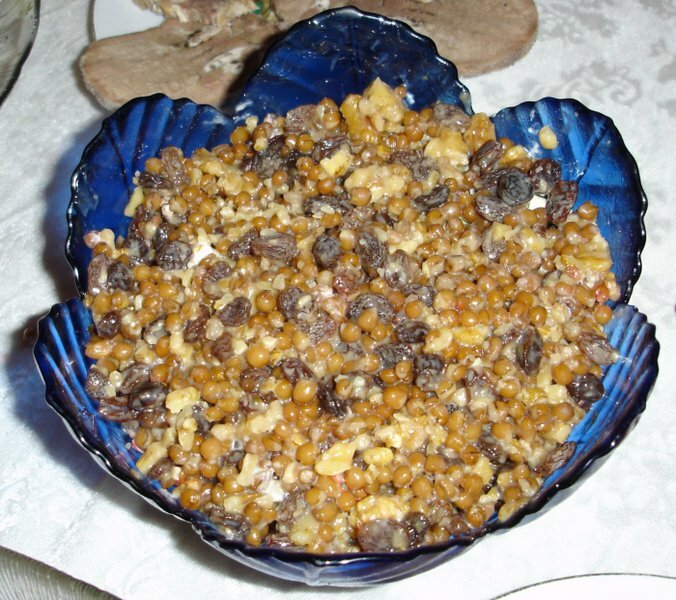 The traditional food for the occasion is Burbara, a bowl of boiled barley, pomegranate seeds, raisins, anise and sugar offered to masquerading children. The general belief among Lebanese Christians is that Saint Barbara disguised herself in numerous characters to elude the Romans who were persecuting her. Here is a recipe for loukoumades so you can celebrate in Greek style. In a large bowl, mix the yeast and sugar with ½ cup of the warm water. When the mixture turns foamy (about 5 minutes), stir in the remaining 1½ cups of warm water along with the flour, salt, nutmeg, and vanilla. Mix until the batter is thick and smooth. Pour vegetable oil into a deep fryer, or saucepan making sure there is at least 2 inches between the oil surface and the top of the pot. Heat the oil to 350°F/. Working in batches, slide dollops of the batter (about the size of a heaped tablespoon) into the hot oil, making sure not to crowd the pan. Dollops will puff up and float to the surface. Turn occasionally, until the balls are a crisp, golden brown on all sides, about 3–4 minutes. Remove carefully with a slotted spoon and drain on wire racks. Repeat as many times as is needed. Place drained puffs on warm platter and keep warm. To serve, drizzle honey over them, and dust generously with powdered cinnamon.